Last week I was digging through the archives of Dr. J. Allen Hynek's Center for UFO Studies (CUFOS) when I came across something really odd. Let me tell you, there's a lot of odd stuff in those files, but what I found last week was a standout. It was a June, 1985 newsletter from an organization I had never heard of before: "Citizens Against UFO Secrecy," or CAUS. I shouldn't even have to say this, but CAUS is a terrible acronym. It doesn't sound UFO-y or extraterrestrial at all. Of course, the organization seems to be run by a lawyer who calls himself UFOLAWYER, so that could explain it. Then there's the mission statement. 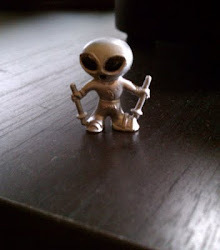 It's all standard Disclosure claptrap: earth is being visited by aliens, and we have a right to know, blah, blah, blah. 4) 'Beyond a Reasonable Doubt,' a promotional and fundraising video on behalf of CAUS. 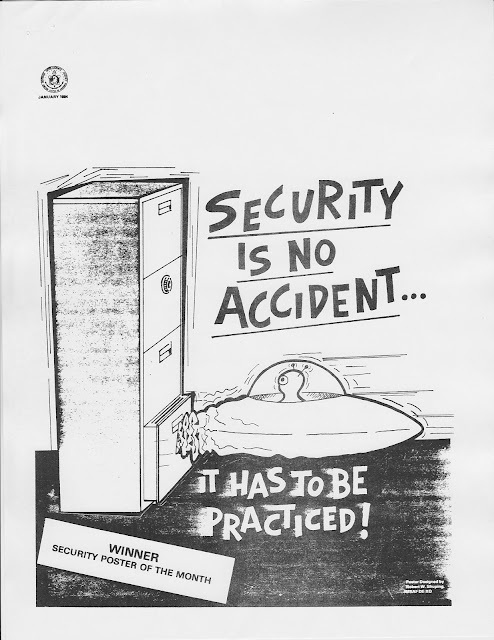 But the best, oddest part of this CAUS newsletter was a reproduction of a security poster published by the Defense Intelligence Agency (DIA) in 1964, to warn government employees to keep their mitts off of the government's Top Secret UFO files. Is it any wonder that this security poster won the DIA's coveted "Security Poster of the Month" competition? Look at the clean lines, the purity of its concept and execution, the funny look on the alien's face as he/she/it rams into the file cabinet... It's priceless! Is it also any wonder that in the first ten days after this poster was posted all around that one file cabinet that housed all of the U.S. Government's most precious and sensitive UFO files, theft of those files decreased 17%?? True fact! Ha- I found this thanks to Peter Gersten posting a link on Facebook! I'm interested to know just what is in this Hynek files. There are two in particular I'd like to see. Hi Curt, I like your blog! What are the two things you want to see in the Hynek files? The Cash-Landrum Case. I'd be interested in whatever Dr. Hynek had, but what I really need is the initial Project VISIT report on the case by John Schuessler, circa March 1981. The 2nd file is less important, more one of curiosity, the 1967/68 Carroll Wayne Watts hoax. Watts and Dr. Hynek had some correspondence outside of Blue Book, including photos, and possibly transcriptions of phone calls. If you can help with me getting scans or photocopies of these, it would be greatly appreciated. Email me at sentry579@gmail.com with any details, expenses etc. Hi Curt, I'd be happy to look for these when I get the chance. It sounds as though this information may be in the CUFOS case files? Those are kept at a separate location from Hynek's writings & correspondence, so I haven't spent as much time in those archives, but next time I get there I'll see what they've got on these cases. OK, I'll pursue the Cash-Landrum case files with CUFOS, but the Watts material seems likely to be found in the personal collection. BTW, I tried getting some of this from the Hynek collection at Northwestern University Library, but they said they only had material up to 1971, so I'm a bit confused how things are split uo. Thanks for your help, and I'll let you know if CUFOS turns anything up. Where are you operating out of? 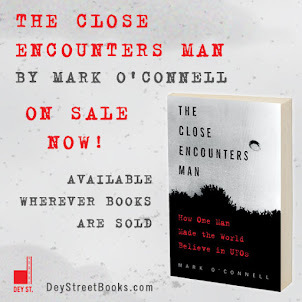 Mark, the NWU reply: "I reviewed the collection, and find that the clippings, files, and photographs relating to UFO do not go beyond about 1971—nothing from 1980. So unfortunately our collection would not have anything relating to the Cash-Landrum incident in 1980." I'm deep down in Dixie, but see I may have to do a cross-country tour of UFO archives. I'd really like to burrow through Dr. Condon's UFO photo collection!